Bean weevils are common pests that attack beans. 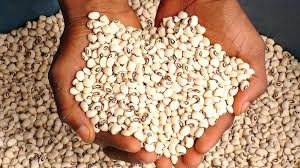 Cowpeas are highly susceptible to pest infestation, and this leads to huge post-harvest losses, lower food quality and poor food safety. the majority of farmers and grain merchants employ various insect control measures, including the use of chemicals not minding the consequences of their actions. To correct the abnormal practice and ensure the safety of foods consumed by the Nigerians, the Ministry of Agriculture and Rural Development conveyed a stakeholders’ meeting in Abuja, bringing together the Nigerian Agricultural Quarantine Agency, the National Agency for Food, Drug Administration and Control (NAFDAC) Standards Organisation of Nigeria (SON), the National Orientation Agency (NOA), and research institutes to find a lasting solution to the menace. The Minister of Agriculture and Rural Development, Audu Ogbeh, while stressing the need to scale up campaign in ensuring Nigerians consume wholesome foods, noted that it would help prevent cases of liver and kidney problems. Both of these structures can be used as domestic, retail and commercial storage for beans and grains in general, and can protect the grains for over 12 months, as long as the air tightness is maintained. He added that even if the beans had been infested, the infested beans could be placed in air-tight containers and placed in home freezers as a cold shock treatment. This method kills all life stages of the insect within four days. Thereafter, the beans can be removed, sieved, aired and kept in air-tight containers under ambient condition as described above.